Oh ... and just in case anyone is looking for something for my stocking ... I will happily take another darling Dress For Cocktails clutch. How about a black velvet to go with all my holiday bows? 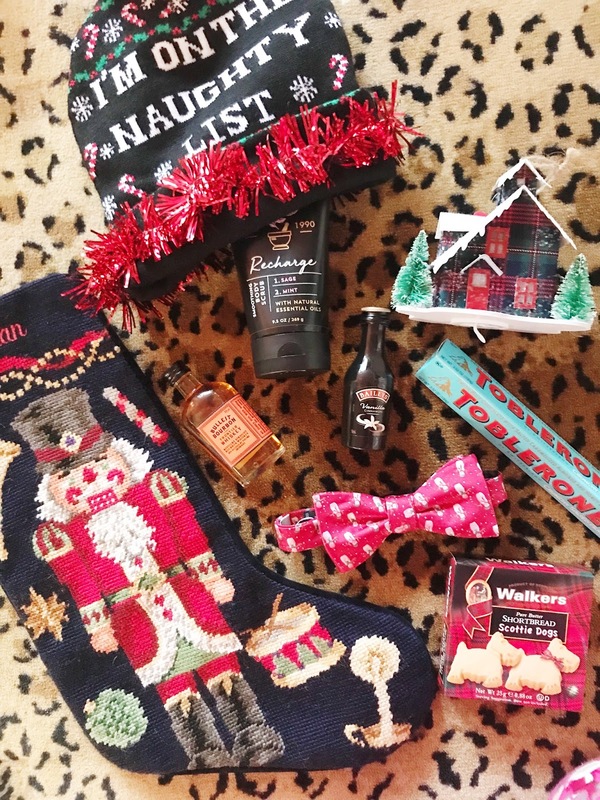 I mean, really, how perfect are they for your stocking? 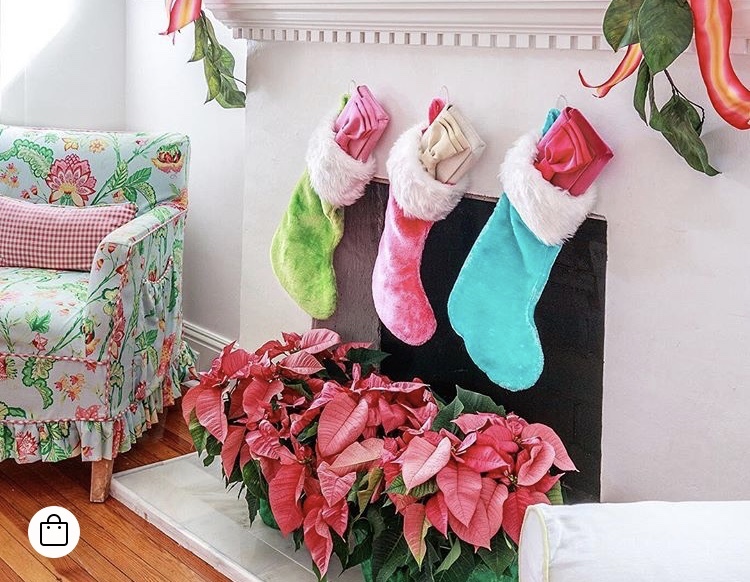 For me the stockings (we own these!) are so much fun to stuff. We wait until Christmas Eve once everyone has retired to their rooms and then I gather my bags which I have previously divided up and get to stuffing. When I was little my mother made our stockings and would stuff them with all kinds of things like toiletries, an orange, chocolate and an ornament for the year. Inside the stocking there would always be one small wrapped gift which always excited me the most. Don't get me wrong ... the new Chapstick and some yummy chocolate was so fun, but that gift really stuck out as a something special since it was wrapped. I continue to do the same with our family and include one wrapped gift. Sometimes it is a special treat or sometimes it is just something I know they need but choosing a tiny box and wrapping it makes it more special for them, and for me. It seems charge cords are always going missing around here so I snagged some new ones for the guys. I found some darling Christmas bow ties so those were added without a second thought. A fun wine stopper for my dad who loves a good glass of wine, a great set of cards for the boys who love to play any card game and a great set of collar stays for Lawyer. I love this amazing scrub for the shower and I grabbed three of them. These fun plaid letter mugs are darling and I will set them on the mantle since they are too wide for the stocking but I considered them a must have! I also added a few favorite treats, an ornament for each person and let's finish it up with some jerky, a few scratch off lottery tickets and a bottle of their favorite spirits. And for that yummy drink they are sure to have on Christmas night by the fire ... add in these darling napkins. I found so many fun things for girl stockings I had to edit my selection. Charge cords for sure, a fun holder to keep them safe when you travel, a fabulous monogram handle cover for a suitcase when you travel, this darling hair bow and a new fabulous barrette. This umbrella was a must for my mom as was this fun ornament. 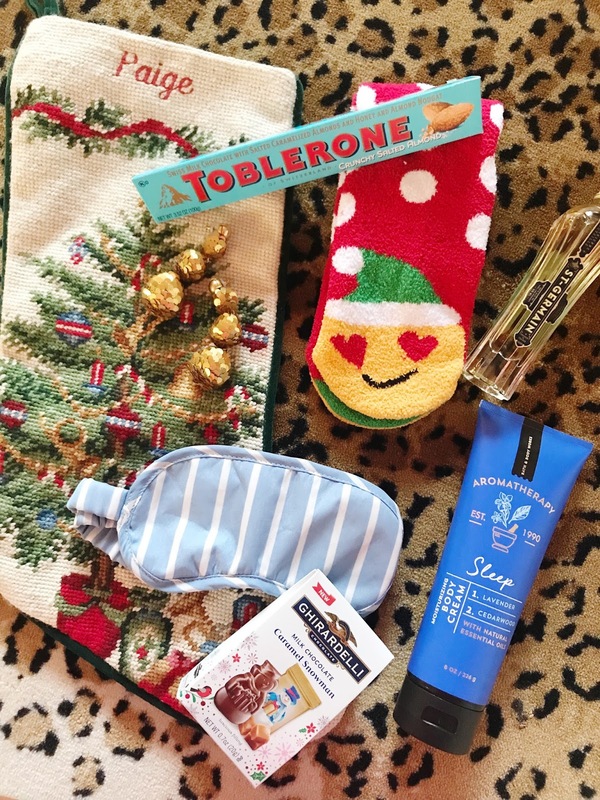 Add in some fabulous lotion for bedtime along with a travel eye mask, some sweet treats and a funny notepad for the youngest and we were done! Lottery tickets are so fun for all as well as a small bottle of their favorite spirit, like Bailey's or some yummy St. Germain Liqueur. Add in your wrapped gift and you are ready to head to bed with stockings stuffed and hung by the chimney with care. Happy Friday ... cheers to Christmas break!